Patio Doors - Volpe Enterprises, Inc. The OKNA Elegante Patio Door is an ideal solution for adding light to any room while making the most of limited space. Available in Replacement and New Construction applications, the elegant design combines the security of structural integrity and the comfort of energy efficiency. A host of options increase the versatility of this series. -Thermally welded multi-chambered 5-5/8″ vinyl frame provides superior strength and thermal insulation. The continuous double weather-stripping dramatically reduces air and water infiltration. -Operating sash is equipped with adjustable, precision bearing tandem rollers for a smooth and quiet operation. Pella’s Patio & French Doors can come with their exclusive snap-in between-the-glass blinds and grilles. This is a nice feature because they are tucked neatly between panes of glass being protected from dust and damage. Pella’s Patio & French Doors have a Multi-point lock that is one of the highest-recognized security rating in the industry. It secures the door at two different points. Pella’s Patio & French Doors come with the option to have Rolscreen. 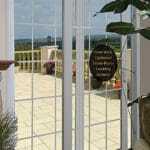 (Retractable Patio Door Screen) This is a self-storing screen that rolls away, out of sight, when not in use. It provides a clear, unobstructed view. The Integrity doors are made with a pine interior and an Ultrex maintenance free exterior. These doors are specifically designed to prevent water and air infiltration as well as an effective barrier against the elements. The Inswing & Outswing French Door is a very stylish door that is perfect for someone looking for a wood interior and a durable exterior. 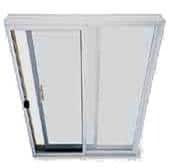 This patio door is also available in a 8′ 0 height as well. The Inswing & Outswing French Door is available in either a pebble gray exterior or a stone white. The interior is available in either a bare pine or a pre-finish. The Sliding French Door is truly an elegant door, built with beauty as well as security in mind. The Ultrex exterior will not only withstand the elements over time but it is also superior in energy efficiency to aluminum or vinyl. The Sliding French Door is available with 2 or 3 panels as well as 8′ 0 heights. The Sliding Patio Door glides very smoothly and with no effort, as well as the top hung screen. Accent this door using either Simulated Dividing Lites or Grills between the glass. The Sliding Patio Door is affordable, durable, and reliable. This door comes standard with Low E II glass and argon gas filled. 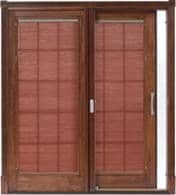 Note: Integrity Patio Doors installed by Volpe Enterprises, Inc.
will have a 20/10 year manufacturers warranty. Andersen doors are available in four distinct styles which combine contemporary and traditional design with convenient operation, low maintenance, and excellent weather tightness. 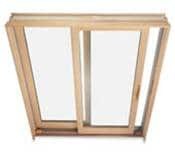 The Frenchwood Hinged Patio Door has one of the highest ratings for weather tightness in the industry, in part because of our patented multiple-point locking system. This unique three-point locking system also provides excellent security, making the lock side of the door as secure as the hinged side. The Frenchwood Hinged Patio Door is available in one, two, and three panel units in 6′ 8″, 6’11”, and 8′ heights. 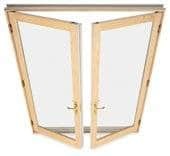 The Frenchwood Gliding Patio Door provides “French style” beauty with traditional gliding patio door convenience, in a low-maintenance, weather tight, and secure design. The Frenchwood Gliding Patio Door is available in stationary side light, two, and four panel units in 6′ 8″, 6’11”, and 8′ heights.